Arriving at MIT in 1950, Ron Kurtz was eager to explore the world of science, but had no interest in the arts. In grade school, Ron did not care for music or enjoy drawing. At the time, he felt that was all art had to offer. Yet for Ron, MIT has always been a place where learning extends far beyond the classroom. He never expected MIT to be the place where the arts would begin to carve out a special place in his life. However, his perspective on creativity began to change through his friends’ involvement in music and MIT’s visible commitment to the arts on campus. An Alexander Calder sculpture in Building 7 always fascinated Ron as he passed by, and sparked his interest in three-dimensional art. His classmates in the dorms played classical music that he had never heard before. Ron and his sophomore roommate even built an amplifier to play music in their room, and began to recognize the differences between various classical composers. For Ron, the artistic exposure he received while at MIT was just as pivotal as his academic achievements. Watching the construction of the Kresge Auditorium roof from the windows of Baker House, he was struck by the combination of engineering and aesthetics as Eero Saarinen’s vision came alive. Following a stint in the U.S. Air Force, Ron returned to MIT to study metallurgy (now materials science), where his previous interest in cast sculpture was galvanized by the work of a visiting artist in the foundry. Given the important role the arts and MIT have played in his life, Ron supported the Center for Art, Science & Technology (CAST) by commissioning a course in honor of his friend and mentor, Professor Merton C. Flemings, which encouraged students to explore the intersection of art, design and materials science. Building off the momentum and energy from the course, CAST and the Self-Assembly Lab in the School of Architecture and Planning organized a two-day conference on active matter and programmable materials. This spring, from April 21 to 22, CAST will hold another major symposium, “Being Material.” Not only will the symposium showcase recent developments in materials systems and design, but it also will place this work in dialogue with kindred and contrasting philosophy, art practice, and critique. Ron will serve as the honorary host for the symposium. 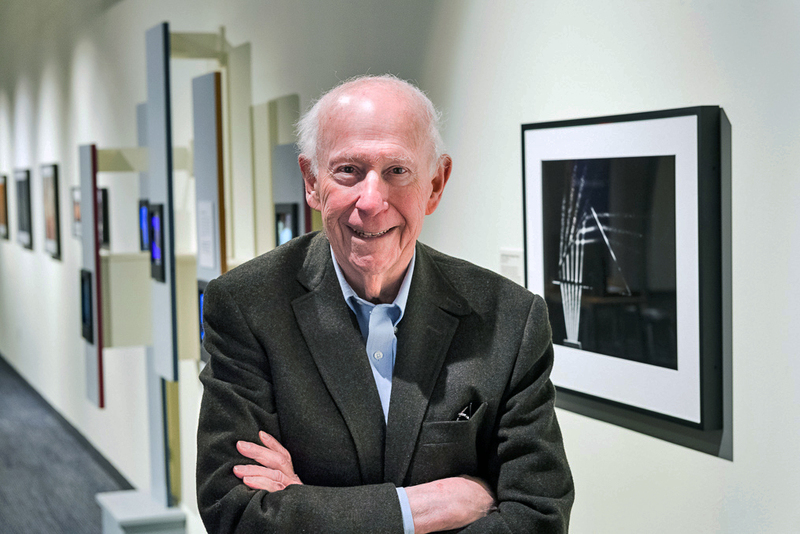 A longstanding member of the Council for the Arts at MIT, Ron’s generosity extends to the MIT Museum, where he donated an historic collection of Berenice Abbott photographs. Through the Kurtz Gallery for Photography, named in his honor, Ron continues to support photography by providing crucial funding for exhibitions. His commitment to MIT goes beyond the arts to support for the Glass Lab and foundry, scholarships, and MIT Sloan. He remains grateful to MIT for the exceptional education he received in all realms of life, and believes that MIT students are highly attuned to the relationship between arts and science. For that reason, Ron admires the multifaceted students who attend MIT today, many of whom remind him of friends he met many years ago. MIT Museum . Photo: Courtesy of the MIT Museum. “Generative drawing” critique, 4.022 Architectural Design Fundamentals, 2015. Photo: S. Lacey. Material Formations critique, Skylar Tibbits Design Studio, 2015. Photo: Sharon Lacey.